In Indian cuisine, dal is eaten with rice or roti. Yet, dal is no different from lentil soup. Depending on your appetite and mood you choose whether to eat as soup or as the main course. Toor lentils are nutrition powerhouse. They carry a great combination of protein, calcium, fiber and carbohydrates, which are recommended daily. Indian cuisine offers many vegetarian, vegan meatless options. Kale, being protein-rich containing 4 gms of protein per 100 gms, has earned the epithet of “queen beef”. A 100 gms serving of kale meets 700% of the recommended daily intake of Vitamin K and 200% of the recommended Vitamin A and C intake, making it a “nutrition powerhouse”. Tomatillos are Mexican husky tomatoes. They are covered in a husky papery shell. After buying at the store make sure to keep intact with their husk which prevents them from spoilage. Tomatillo health benefits include – Prevent damage caused by the sun, pollution and smoke, smooth wrinkles, Improve overall skin texture. I did not know that there are many varieties of kale. For my readers, I am posting them below. Lentils in the below picture are cultivated by my uncle. My mother buys from him after every harvest. They are not split when bought. They are round with skin. These whole lentils are split using a stone mill by hand. Stone-mill is called ‘Visurrayi’ in Andhra Pradesh, ‘Chikki’ in North India. To know more, watch this video. Whole peas are poured in small batches in the hole while they rotate. Rotation splits peas and peas eventually fall off from sides. My mom still has the patience to do this every year. This process splits peas, ready to eat preserving lot of skin. They taste soooo good. My mom knows that I like home split toor dal, that’s why she keeps some for me. 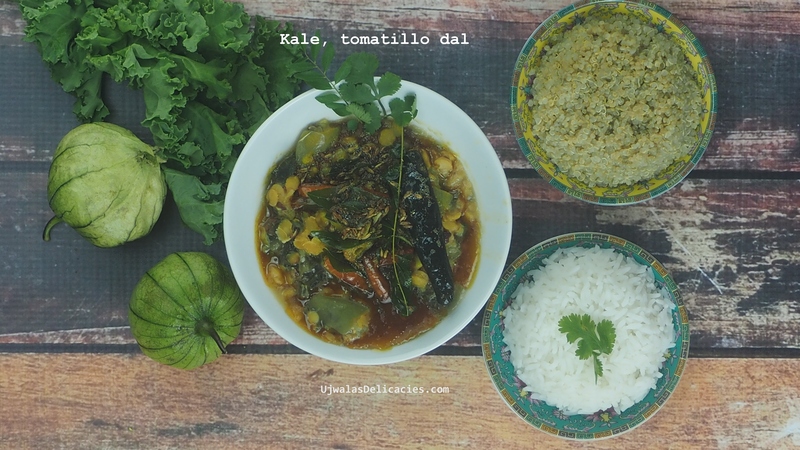 1 cup - toor dal (split pigeon peas). 4 tbsp - Oil of your choice. I used coconut oil. Soak dal for 15 minutes. You can use whole grain toor dal. 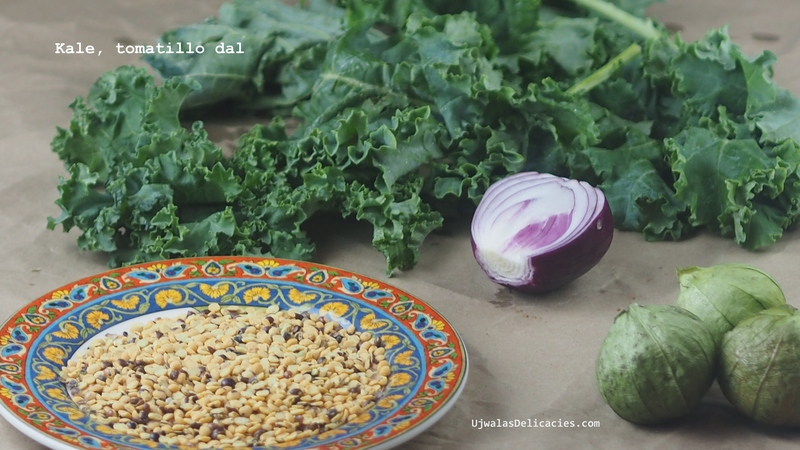 Cut kale, tomatillos, onion, and chilies into pieces. Add vegetables and salt to dal. Cook lentils along with all the ingredients in a pressure cooker for 2 whistles or till soft. Don't over-cook till it becomes mushy. If you are cooking in a pan, close the lid, cook till dal is soft. In a small saucepan, add oil and heat. Add red chilies till brown. When chilies are brown, add mustard seeds. When mustard seeds splutter, add cumin. When cumin is fried, add curry leaves, ginger garlic paste. I add turmeric after curry leaves spluttering settles. Otherwise turmeric color is all over the stove. Now pour hot tampering over cooked dal. After pouring over dal, you can add some dal to tampered pan to deglaze it. Deglazing is a technique to pour some cold liquid into a very hot pan to get up all the brown bits stuck to the bottom of the pan. Those brown bits are where all the flavors are.